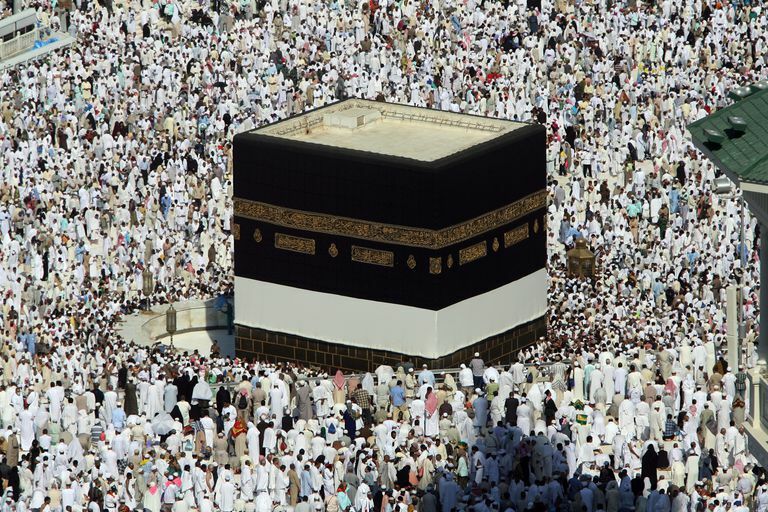 Tens of thousands of Muslim pilgrims performing the Hajj attend the Friday prayers. Muslims honor and respect the Prophet Abraham (known in the Arabic language as Ibrahim). The Quran describes him as "a man of truth, a prophet" (Quran 19:41). Many aspects of Islamic worship, including pilgrimage and prayer, recognize and honor the importance of the life and teachings of this great prophet. The Quran sums up the view of the Prophet Abraham among Muslims: "Who can be better in religion than one who submits his whole self to Allah, does good, and follows the way of Abraham the true in Faith? For Allah did take Abraham for a friend" (Quran 4:125). Abraham was the father of other prophets (Ishmail and Isaac) and the grandfather of Prophet Jacob. He is also one of the ancestors of the Prophet Muhammad (peace and blessings be upon him). Abraham is recognized as a great prophet among believers in the monotheistic faiths, such as Christianity, Judaism, and Islam. "Abraham was not a Jew nor yet a Christian; but he was true in Faith, and bowed his will to Allah (which is Islam), and he joined not gods with Allah" (Quran 3:67). Say: "(Allah) speaketh the Truth: follow the religion of Abraham, the sane in faith; he was not of the Pagans" (Quran 3:95). Say: "Verily, my Lord hath guided me to a way that is straight,- a religion of right,- the path (trod) by Abraham the true in Faith, and he (certainly) joined not gods with Allah" (Quran 6:161). "Abraham was indeed a model, devoutly obedient to Allah, (and) true in Faith, and he joined not gods with Allah. He showed his gratitude for the favours of Allah, who chose him, and guided him to a Straight Way. And We gave him Good in this world, and he will be, in the Hereafter, in the ranks of the Righteous. So We have taught thee the inspired (Message), "Follow the ways of Abraham the True in Faith, and he joined not gods with Allah" (Quran 16:120-123). Aazar, the father of Prophet Abraham, was a well-known idol sculptor among the people of Babylon. From a young age, Abraham recognized that the wood and stone "toys" that his father sculpted were not worthy of worship. As he grew older, he contemplated the natural world such as the stars, moon, and sun. He realized that there must be only One God. He was chosen as a Prophet and dedicated himself to the worship of One God, Allah. Abraham questioned his father and community about why they worship objects that cannot hear, see, or benefit people in any way. However, the people were not accepting of his message, and Abraham was finally driven from Babylon. Abraham and his wife, Sarah, traveled through Syria, Palestine, and then on to Egypt. According to the Quran, Sarah had been unable to have children, so Sarah proposed that Abraham marry her servant, Hajar. Hajar gave birth to Ismail (Ishmail), who Muslims believe was Abraham's first-born son. Abraham took Hajar and Ismail to the Arabian Peninsula. Later, Allah also blessed Sarah with a son, whom they named Ishaq (Isaac). In the Arabian Peninsula, Abraham, Hajar, and their infant son Ismail found themselves in a barren valley with no trees or water. Hajar was desperate to find water for her child, and ran repeatedly between two hillsides in her search. At last, a spring emerged and she was able to quench their thirst. This spring, called Zamzam, still runs today in Makkah, Saudi Arabia. During the Hajj pilgrimage, Muslims reenact Hajar's search for water when they pace several times between the hills of Safa and Marwa. As Ismail grew up, he was also strong in faith. Allah tested their faith by commanding that Abraham sacrifice his beloved son. Ismail was willing, but before they followed through, Allah announced that the "vision" had been completed and Abraham was allowed to sacrifice a ram instead. This willingness to sacrifice is honored and celebrated during Eid Al-Adha at the end of the Hajj pilgrimage. The Ka'aba itself is believed to have been rebuilt by Abraham and Ismail. There is a spot just next to the Ka'aba, called the Station of Abraham, which marks where Abraham is believed to have stood while erecting the stones to raise the wall. As Muslims make tawaf (walking around the Ka'aba seven times), they begin counting their rounds from that spot. Muslims close each of the daily prayers with a du'a (supplication), asking Allah to bless Abraham and his family as follows: "Oh Allah, send prayers upon Muhammad, and the followers of Muhammad, just as You sent prayers upon Abraham and the followers of Abraham. Verily, You are full of praise and majesty. Oh Allah, send blessings upon Muhammad, and upon the family of Muhammad, just as You sent blessings upon Abraham, and upon the family of Abraham. Verily, You are full of praise and majesty." What does the Quran teach about Jesus? Who Are the Sufis of Islam? Is the Crescent Moon a Symbol of Islam as Is Widely Believed? What Is a Minbar in Islamic Mosque Architecture? What Is a Mosque or Masjid in Islam?